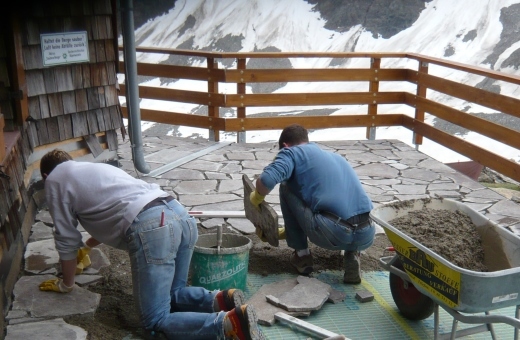 A logistical challenge at 2,608 meters above sea level: the sun terrace of Baden Lodge in the East Tyrolean Alps, Austria was renovated with all materials brought to their destination by helicopter due to the hut only being accessible on foot. 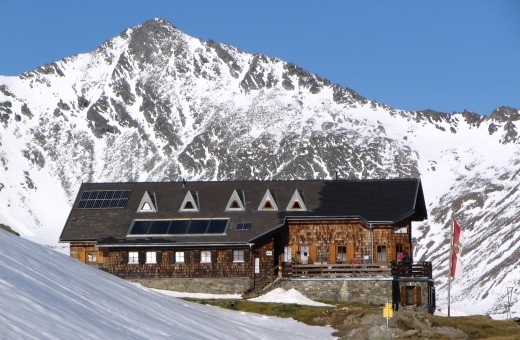 In order to save transportation costs for future renovations, the owner of the chalet – the Austrian Alpine Association – looked for a solution that would provide maximum safety against damage due to extreme weather conditions in the mountains. He opted for Gutjahr System Technology, now available from BAL, utilising the AquaDrain EK drainage mat, as the substructure. From the sun terrace of the Baden chalet, climbers enjoy panoramic views of the Alps – and since summer 2008 they have enjoyed these spectacular views from beautifully restored natural stone flooring. Because strong sunlight, large amounts of rain, snow and ice had greatly damaged the old stone, the owners wanted to protect the newly installed polygonal porphyry stone against this damage. Thanks to the capillary breaking drainage mat AquaDrain EK, the installation will be free from permanent damage. The system has been specifically designed for the safe installation of natural stone and allows for drainage through drainage mortar. It prevents moisture storage in the substructure, with surface water running through to the drainage channels and away from the assembly. As a result, the drainage property of the overall construction improved by up to 20 times. The natural stone surface can also dry faster because the construction is ventilated. AquaDrain EK is the only product on the market with a special mesh fabric that has a long-term limit state and thus remains permanently water permeable. 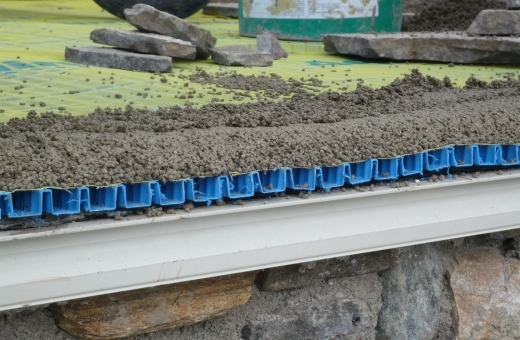 This is unlike drainage mats with geotextile felts which are limited in their function, due to being clogged and blocked by soluble limestone deposits. The Baden Lodge is a high alpine shelter, owned by the Austrian Alpine Association, Baden Section. It lies in the Frosnitztal Valley near Matrei which is part of the Venediger mountain group in the East Tyrolean Alps. The hut was initially built on a trial basis in 1910 in Mödling, Vienna before being dismantled and transported to Matrei where it was reconstructed in 1911 before being expanded and renovated in 1959, 1986 and 1996. The Baden Lodge offers 41 mountaineering and 15 camp beds.